Registration will close on May 10, 2019, OR when 70 entries are received, whichever comes first. NON-US CITIZENS MUST CONTACT THE MEET DIRECTOR BEFORE REGISTERING! 1st – 3rd in each weight class for each division. Open division is the default division. Age category records can be set, but there will be no age group divisions. Meet will be a One-Platform meet with a maximum of 70 competitors. An afternoon session has been added due to demand. Registration will close when the roster reaches 70 athletes. There will be no waiting list. No refunds will be given. Spectator fee: $10, payable at the door the day of competition. Early Registration: Available for DC residents and Balance Gym members only. Opens at midnight on Friday, January 25, 2019. Only 30 spots will be available during this early registration period. General registration: Available for all USA Powerlifting members. Opens at midnight on February 1, 2019. Registration will close on March 22, 2019, or when 65 entries are received, whichever comes first. This is a single platform, three-lift meet, open to athletes age 14 and above. There will be a morning and afternoon session, with the schedule announced after registration has closed. All athletes must have an active membership with USA Powerlifting in order to register for the meet. Memberships can be purchased here. Proof of membership will be required during check-in. Please have a copy of your membership card (or e-mail proof of purchase) and a valid ID when you arrive. A one-piece singlet is mandatory for all athletes! ALL equipment (including knee sleeves, belts, wrist wraps, t-shirts, and undergarments) must conform to USA Powerlifting standards. Please see the USA Powerlifting Rule Book for information regarding personal attire. There will be a Raw division and a single-ply Equipped division. Best Lifter Award for overall best female and male lifter. Drug testing will be conducted per USA Powerlifting rules. Please verify that all your medications and supplements are not prohibited. If necessary, you may obtain a Therapeutic Use Exemption. Check the Facebook event page, Instagram page, or website for updates. You may also e-mail campbeco@gmail.com with any questions. Registration will open on Friday, January 4th, 2019 at 1:00 PM. Registration page can be found HERE. Registration will close on March 9th, 2019, OR when 120 entries are received, whichever comes first. 1st – 3rd in each weight class for each division. Open division is the default division. Entry into Teen, Junior or Masters divisions can be added below. Registration will close on June 1, 2018, OR when 80 entries are received, whichever comes first. Meet will be a One Platform meet with a maximum of 80 competitors. Registration will close when the roster reaches 80 athletes. 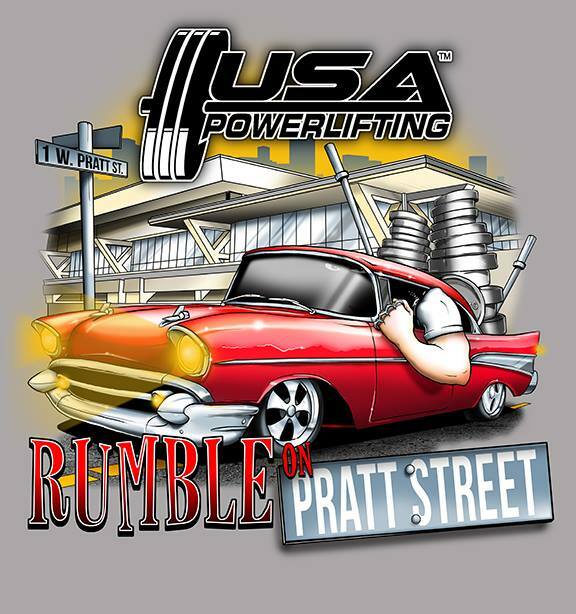 To be considered for the waiting list, please contact the meet director by e-mail with “2018 Rumble on Pratt Street” in the subject line, along with your full name, gender, and weight class in the body of the email. NOTE: There will a limited number of t-shirts for sale at the meet. Spectator fee: See ticket information at the Baltimore Fitness Expo website. Please note the meet director has no control over ticket pricing for the Baltimore Fitness Expo. PRELIMINARY ROSTER CAN BE FOUND BELOW, AND IS SUBJECT TO CHANGE! WEIGHT CLASS INFORMATION IS FROM YOUR ENTRY FORMS. DUE TO EXTENSIVE REQUESTS FOR WEIGHT CLASS CHANGES, THERE IS A HIGH PROBABILITY THAT THE MEN’S 93 KG CLASS WILL BE MOVED TO FLIGHT 2C. This will be a two day event with one platform and a 120 lifter cap. This is a full 3 lift power meet with cash prizes for the best 1st-3rd overall male and female lifters! Push-pull and bench or deadlift only are welcome! In the event of a sell out, email chrisaydin@gmail.com to be put on a waiting list. Registration will close on February 10, 2018, OR when 120 entries are received, whichever comes first. If I have 10+ equipped lifters (male or female), I will give out an additional cash prize for the best overall lifter. SCHEDULE IS TENTATIVE! The exact breakdown will be determined once registration is full. Eligibility: This meet is open to all current USA Powerlifting members. Memberships can be purchased online at http://www.usapowerlifting.com/member-tools/membership.php. Membership cards will not be sold at the meet. ENTRY FEE: $90, This will include 1 coach’s pass per lifter. Roster and flights will be posted to the Facebook event page. Meet Updates and Info: Any meet information or updates will be emailed directly to lifters as well as posted on the event page. Registration will close on November 18th, 2017, OR when 120 entries are received, whichever comes first. To be considered for the waiting list, please contact the meet director by e-mail with “2017 Equinox Open” in the subject line, along with your full name, gender, and weight class in the body of the email. This is a one day event with one platform and a 60 lifter cap. This is a full 3 lift power meet. In the event of a sell out, email chrisaydin@gmail.com to be put on a waiting list. Registration will go live on Sunday June 11th at 12:00pm EST. Registration will close on August 26, 2017, OR when 60 entries are received, whichever comes first. This is a last chance qualifier for 2017 Raw Nationals. If you plan to use this meet as a qualifier, keep in mind registration for nationals ends on September 11th at 12:00am EST. Roster and flights will be posted to the USA Powerlifting Maryland web site and the Facebook event page in August. Meet Updates and Info: Any meet information or updates will be emailed directly to lifters as well as posted on the event page and USA Powerlifting Maryland website.